The mean-time-to-repair an IT service is a critical measure for most IT organizations. Recent industry survey data from Forrester Research and the itSMF report that IT organizations have made little progress in improving this measure despite its importance to the overall perception of IT operations. 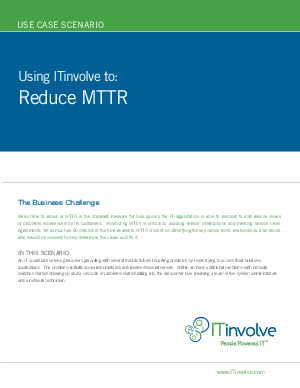 The good news is that there is a new approach, built using familiar social collaboration principles, that can help you reduce MTTR by at least 30% without replacing your existing tools. Read this use case document to learn more.